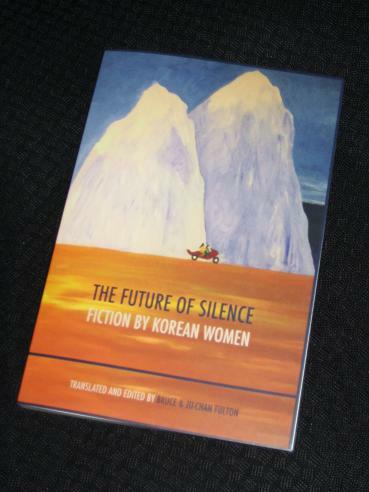 The Future of Silence – Fiction by Korean Women (review copy courtesy of Zephyr Press) is a new version of the 1997 collection Wayfarer – New Fiction by Korean Women, an excellent anthology of short stories by female Korean writers (which I reviewed here a couple of years back). With that book now out of print, the Fultons have found a new home for some of the stories, keeping five of the eight original contributions and adding four new pieces from a younger generation. In doing so, they’ve created a book reflecting five decades of Korean literature, showing the shift in focus of the stories over the years. The standout story from the original selection is still O Chong-hui’s ‘Wayfarer’, a piece depicting a woman’s struggle to reintegrate herself into society after a traumatic experience. For a western reader, her story may be rather confusing, with friends and family abandoning her in a way which would be unthinkable in other societies. Having learned a lot more about Korea since the first time I read this story, I also enjoyed the little cultural touches, such as the descriptions of Seoul at night, but it’s the way O withholds information, only gradually revealing details of the event that caused the woman’s breakdown, that makes the story so compelling. Two of the writers, Pak Wan-so (Park Wan-suh) and Kim Chi-won, passed away between the publication of the two books, and the new edition is dedicated to their memory. I’m still not a fan of Pa(r)k’s cheery, brash style, but ‘Identical Apartments’ does put an interesting slant on the common Korean theme of city living. Meanwhile, Kim’s ‘Almaden’ (revised by the Fultons in accordance with the writer’s wishes) describes the stark contrast between a woman’s dull life working in a liquor store and her fantasies of running off with a man who regularly drops by for a bottle of wine. Kong Son-ok’s ‘The Flowering of Our Lives’ is another story which never really grabbed me, the selfish tale of a woman neglecting her daughter in the same way her own mother abandoned her, but So Young-on’s ‘Dear Distant Love’ does a far better job of portraying a woman trodden down by society (and a truly horrible lover). Despite being used and abused, her child taken from her to grow up with the lover’s family, there is a glow to the central character that belies her situation. Her strength shines through, even if the lover can’t see it (and certainly doesn’t deserve it…). So far, The Future of Silence has merely mirrored Wayfarer, but the addition of four new stories from a younger generation has the effect of showing the major changes in Korean writing over the past decade. Where the older stories (including the three cut for this new book) focused very much on women and their misfortunes, the younger writers have moved on, looking for new themes to examine, no longer tied to laments about a male-dominated society. It’s no accident that I’m fodder for the neighborhood delinquents. I’m a target. A target that gives bullies a sense of belonging. If you’re in a gang, the first person you target is someone who’s different. And my skin, my eyelids, and my nose are most definitely different from theirs. So I’m different from them. Which means I’m a threat to them, something engraved in their consciousness, something they have to expel. That’s why they form a barrier in front of me whenever we cross paths. Kim Ali has been given her unusual name by her father, a former boxer, and she draws on the great man’s strength to deal with the daily existence of a child with foreign blood in a country which is still largely monocultural. As Ali steels herself to float like a butterfly (and, if possible, sting like a bee), supported by her aunt and grandma, its hard not to warm to her and will her on in her attempt to master the complexities of double skipping (writing this on the day after Muhammad Ali’s death, I can’t help but see this story as yet another example of the boxer’s worldwide renown and affection…). Of the additional pieces, the shortest, Han Yujoo’s ‘I Ain’t Necessarily So’, is probably my least favourite. Running to just under five pages, it features the ramblings of a writer playing with words, with the left hand and right hand having different agendas. It’s clever enough, but I’m not sure it really works, particularly as the play on the similarity of the Korean homophones ‘horse’ and ‘word’ doesn’t really come across into English. If you can imagine teeming bugs exposed to daylight when the rock covering them is lifted, if you can imagine them scuttling off, that’s what the Babel of languages is like here. The syntax, the tenses, the melody that only the gods can decipher and delight in – if on the five lines of a musical score you were to notate for each of the languages the masculine and feminine, the singular and plural, active and passive, low speech and honorifics, you would have a majestic orchestral performance of the heptatonic scale of human vocal sounds: the velar, the lingual, the bilabial, the dental, the semi-dental, the nasal and the guttural. As beautiful as that may sound, the feeling underpinning the story is one of sadness, with the residents of the museum knowing that they will never have a real conversation in their mother tongue again – and that with their death, the language dies too. There’s only one way to describe Kim’s work here, Borgesian, and that’s intended as a huge compliment.